Christian Academy Schools Superintendent Richard Dray, left, accepts the School Choice Week proclamation Mayor Mike Barhorst declared to be Jan. 20-26, in Sidney. SIDNEY — This week, Jan. 20-26, is officially School Choice Week in Sidney. 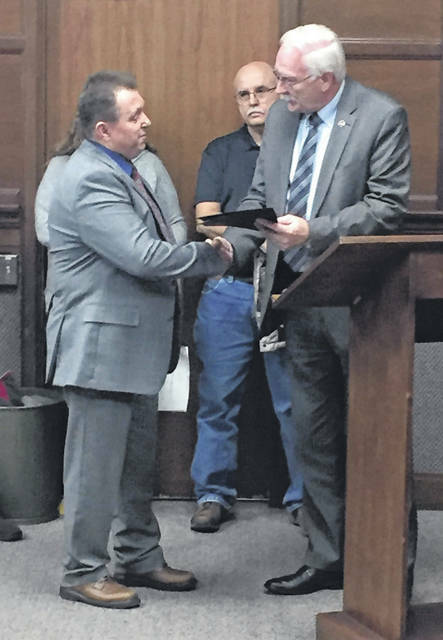 Mayor Mike Barhorst presented the proclamation during Monday’s Sidney City Council meeting to Christian Academy Schools Superintendent Richard Dray. Barhorst noted School Choice Week is celebrated across the country by millions of students, parents, educators, schools and organizations to raise awareness of the need for effective educational options. During the presentation he said all Sidney children should have access to the highest-quality education possible and that educational variety not only helps diversify the economy, but also enhances the vibrancy of the community. Barhorst said the city recognizes the important role an effective education plays in preparing all Sidney students in to be successful adults, and that Sidney has many high-quality teaching professionals who are committed to educating the city’s children. In other business, council adopted two ordinances to levy special assessments for the construction and repair of certain described sidewalks in Sidney and for the amendment of an ordinance regarding the city’s purchasing card policy. The amendment of the ordinance on the city’s purchasing card policy added new language to the city’s current purchasing card policy in order to come in compliance with House Bill 312. • Within the definitions section: (a) remove the reference to the “North Dixie Drive Beauty Strip;” and (b) change the name the name of the “Sidney Municipal Swimming Pool” to “Sidney Water Park,” and add “Piper Park” to the inventory of parks. • The section on dogs: add “dog waste responsibilities,” requiring that those in control of a dog in the park be required to remove and dispose of dog waste. • Under recreational facilities: remove reference to “shuffleboard courts” at Custenborder Fields. • In the hours section: (a) add “The Sidney Water Park” to the parks hours, closed from 10 p.m. to 6 a.m.; and (e) give authority to the “Park Ranger” to order removal of an illegally parked vehicle by towing, in addition to the police department. • In the penalty section: remove the reference to possession of firearms in a park or beauty area being an illegal activity. • To authorize City Manager Mark Cundiff to advertise for bids for various items and projects. • To declare the necessity for repair/replacement of certain curb and gutters in Sidney and requiring abutting property owners to repair or replace the same. Magoto told council the “resolution of necessity” is the first step of the 2019 curb and gutter program that will require property owners to make the repairs. The total estimated curb and gutter needing repaired or replaced is 12,219 of linear feet at an estimated cost of $439,884. This estimated 12,219 linear feet, Magoto said, includes approximately 2,643 linear feet, which is driveway or adjacent to the driveway and therefore the responsibility of approximately 128 property owners. • To authorize Cundiff to enter into a housing revolving loan fund administration agreement with the state of Ohio Development Services Agency. • To amend a resolution to increase the maximum amount of the downtown rehab loan previously authorized to be granted to Terry A. Develvis from $12,000 to $14,000 for necessary improvements at 111 S. Ohio Ave. Community Development Director Barbara Dulworth told council a beam above the storefront of the building must be replaced to make the building safe. During the city manager comments part of the meeting, Cundiff thanked city employees who worked all night over the weekend spreading salt and plowing snow. He also reminded the public city offices will be closed Monday, Jan. 21, in observation of Dr. Martin Luther King Jr. Day. Trash pick up will not be affected, he said. In final business, council went into an executive session to prepare for negotiation sessions with public employees and the employment of a public employee. No action was taken by council members when they emerged from the session.